Khalil Turner (3) and Sankofa Freedom are off to their first state championship in program history after beating Lourdes Regional in the PIAA Class 1A semifinals on Monday. 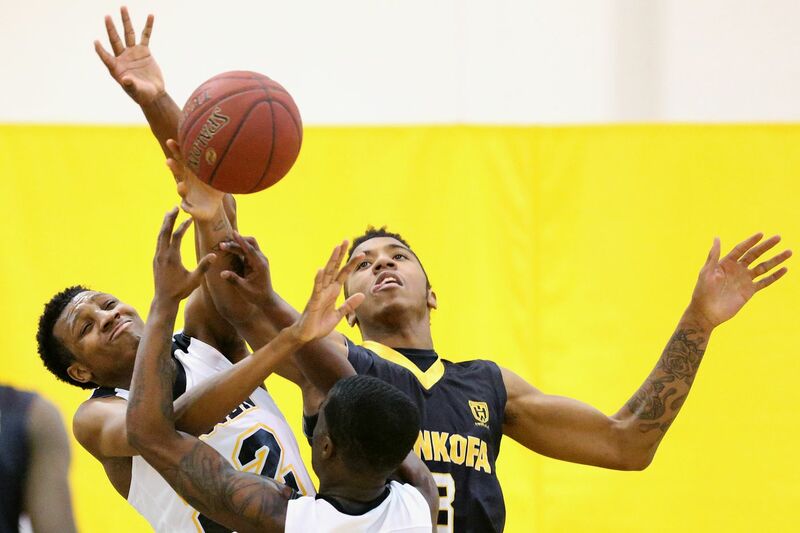 The Sankofa Freedom boys’ basketball team made program history on Monday. With a 66-49 victory over Lourdes Regional in the semifinals of the PIAA Class 1A playoffs at Bethlehem Freedom High, the Warriors made the state championship for the first time ever. Next up for Sankofa is Vincentian Academy on Thursday at 2 p.m. at the Giant Center in Hershey. The Warriors trailed after the first quarter, 21-16, but they went on a 15-0 run to close out the first half and gain a 37-28 lead. Thomas said defensive pressure by Kobe Devine and Khalil Turner led to easy buckets. Derrius Ward recorded a team-high 23 points and Scott Spann scored 16. Turner added 11 points and Devine had 10. Thomas said his squad’s selfless style of basketball has led to their success this season, and it could end with a championship on Thursday. Elijah Taylor scored 18 points as Imhotep Charter rolled past Hickory, 65-46, in the semifinals of the PIAA Class 4A playoffs. The Panthers will look for a third straight state title when they play Bonner-Prendergast on Thursday at the Giant Center. Xavier recruit Dahmir Bishop contributed 12 points, and Jamil Riggins and Chereef Knox added 10 apiece. Imhotep was without Donta Scott, who was ejected for throwing an elbow in the quarterfinals game against Bishop McDevitt-Harrisburg. The championship against the Friars will be a rematch of the District 12 Class 4A championship. Bonner-Prendergast beat the Panthers, 59-57, in overtime in the game. Despite that loss, Imhotep coach Andre Noble isn’t looking to seek revenge against the Friars. Jaylen Stinson scored 17 points and Rahsool Diggins added 15 to lead Archbishop Wood past Abington Heights, 63-53, in the semifinals of the PIAA Class 5A semifinals. Daeshon Shepherd tallied 13 points and Julius Phillips netted 10. The Vikings will play Moon in the finals on Friday at the Giant Center at 8 p.m.
Upper Dublin held a lead late in the fourth quarter, but the Cardinals couldn’t hold on as they lost to Peters Township, 51-46, in overtime in the semifinals of the PIAA Class 6A playoffs. Jess Polin and Dayna Balasa each scored nine points for Upper Dublin. Jackie Vargas and Sarah Eskew added eight points apiece.